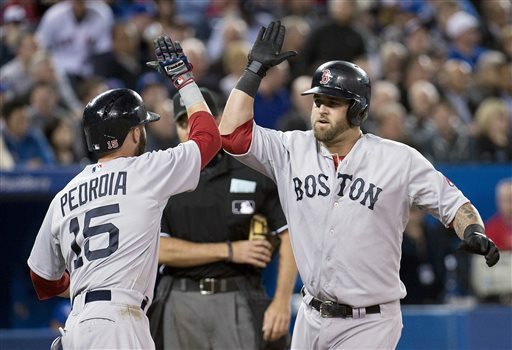 TORONTO (AP) — Mike Napoli hit a two-run homer and drove in the go-ahead run with an eighth-inning groundout, Will Middlebrooks added a solo shot and the Boston Red Sox beat the Toronto Blue Jays 6-4 on Friday night. Junichi Tazawa (1-0) got the win despite allowing a tying homer to Jose Reyes in the seventh. Andrew Bailey pitched the eighth and Joel Hanrahan finished for his second save. Pinch-hitter Jonny Gomes drew a one-out walk from Esmil Rogers (0-1) in the eighth and went to third on Dustin Pedroia’s double. Napoli followed with a grounder to third that was gloved by Maicer Izturis, who fell down on the play and couldn’t recover quickly enough to throw home. The Blue Jays put runners at second and third with one out in the bottom half, but Bailey got Adam Lind and Izturis to fly out.